Our client wanted us to paint and refinish the kitchen cabinets of her home located in Fort Pierce, Florida on Hutchinson Island. As you can see from the pictures, the kitchen cabinets don’t look too good. Now, as we suspected, our client informed us that the previous staining job was pretty messy. We will talk more about that later; let’s get back to what we were asked to do. So, our client wanted us to paint the kitchen cabinets to a solid off white color. Want to know what we did next? Well, read on…………..
We always, always stress on the fact that making the right plans and preparations are necessary. It doesn’t matter how big or small a project really is, planning and preparing is necessary. You need to have the right sand papers, primers, colors, paint brushes, paints, sprayers, etc in place before starting with the project. Otherwise, things will get really messy! For this kitchen cabinet refinishing project in Hutchinson Island, we brought all the doors and drawers of the kitchen cabinet to our shop. This clearly shows why you shouldn’t hire anyone other than professional kitchen cabinet painters for your project. Amateur painters and part-time workers will do a below-par job and you will end up spending more money in the end. Talking about our prep work, have a look at how we accomplished this. Kitchen cabinets accumulate dirt and grease over time. Before proceeding with the painting, it is important to clean the surface thoroughly and remove any kind of dirt. We used tri-sodium phosphate solution to clean the surface and allowed it to dry. Once the surface dried completely, we used a palm sander to sand the doors and drawers at our shop. This was done to make sure the new paint sticks well. We applied two coats of oil primer to make sure the surface is prepped up for the new paint. Primer acts a good base for the paint; so it’s a very important step in a painting process. Once the surfaces of the kitchen cabinets were cleaned, sanded and primed, it was time for us to start the painting. At Jaworski Painting, we use the best paints and materials in the industry. Accordingly, we started painting the kitchen cabinets with Sherwin Williams Pro, which is an oil-based paint and provides excellent finish and durability. We applied two coats of paint and used spray painting mechanism to achieve a smooth factory-grade finish. Needless to say, the cabinets looked as good as new after the painting was completed. 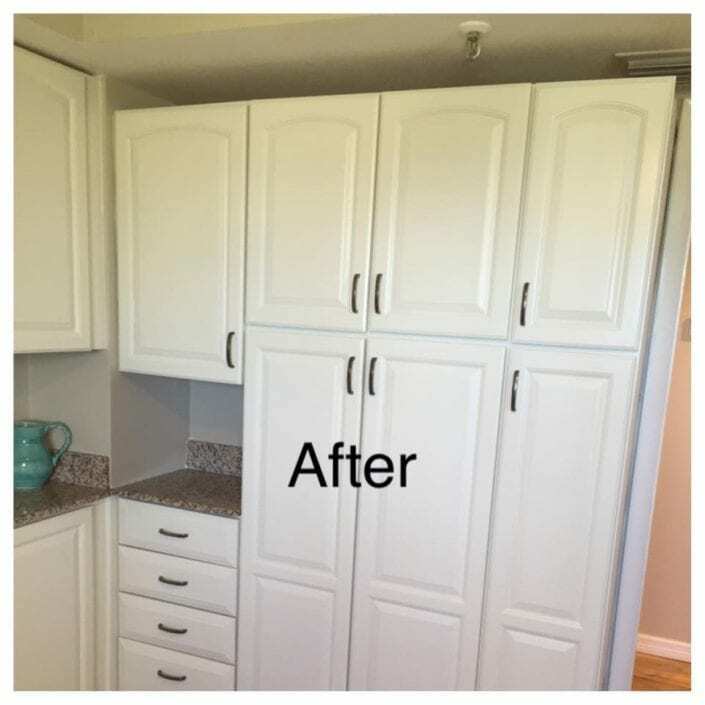 Our client was very happy with the work and the fact that we changed the appearance of her old, shabby kitchen cabinets into smooth and shiny new ones was a pleasant surprise for her. Why don’t you check out the before and after photos and see the fantastic transformation for yourself? Impressed? Well, if you’re bored of staring at your same old kitchen cabinets, just give us a call! 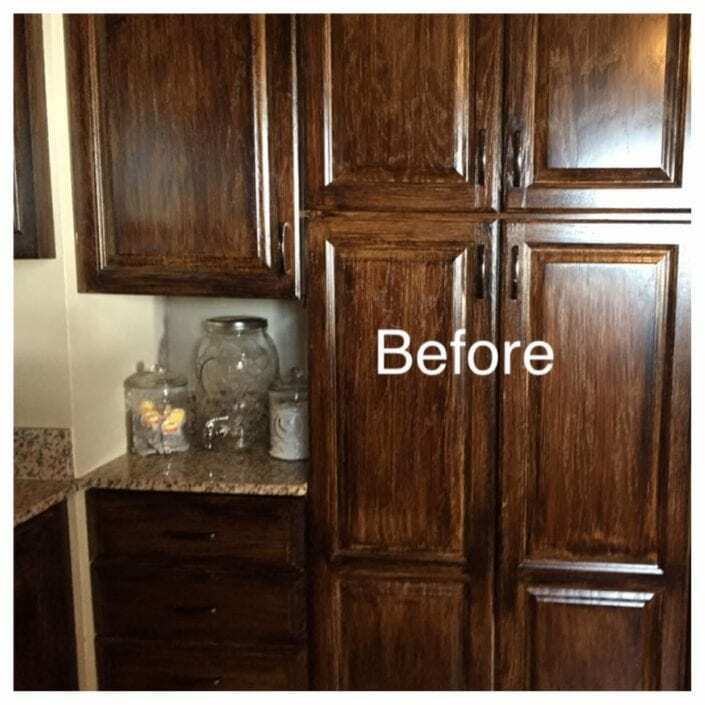 We will turn your kitchen cabinets into something that looks brand new. Our experienced kitchen cabinet painters can help transform your kitchen cabinets today!